In September of 2001, Hope Community Church, dedicated a new, $2.3 million dollar facility on eleven acres in Newburyport, MA. The building houses the sanctuary, a fellowship hall, gym, classrooms and offices. There are soccer and baseball fields and ample parking on the church grounds. Shanahan Sound & Electronics, Inc. installed a sound and video system that combines accommodations for a full, praise band with large rear-projection technology. Realizing the power and vitality these systems bring to the contemporary worship experience, Pastor William Swilling emphasized the importance of getting the audio/visual contractor on board early in the design process. "If I were to give anyone planning to build a church advice of value it would be this; the building contractor has to consider the a/v systems from the get go. 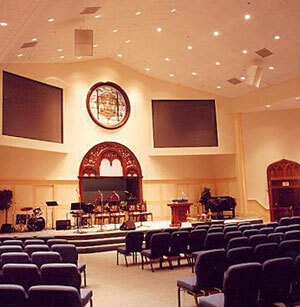 Our contractor had built a lot of churches, but because they did not understand contemporary a/v, we had a great deal of conflict in getting the room built correctly." According to Shaun Crossen, lead systems specialist for Shanahan, "A central cluster would have been the ideal solution for this room but, by the time we were called in, the platform, screens, stained-glass window and cross had been located and framed. We went with a left/right configuration and flew the speakers a little higher than we liked so that no line of sight would be obstructed." Nonetheless, Swilling says that the church is very pleased with the job Shanahan did once they were on board. "I would emphasize, again, the importance of getting the a/v specified with the original design. And I would advise having a contractor like Shanahan approve of the plans before anything moves ahead. Had we done this, we would have saved ourselves a lot of time, money and stress."